Socca is an unleavened, savory pancake made of chickpea flour, and is a popular street food in the south of France. I’ve never been to France or had authentic socca, so I can’t verify if this is even close to the real thing, but it’s pretty tasty. Socca, made simple and plain, is perfectly delicious in its own way, but the last time I made it, I decided to add some salty and tangy elements into the batter, which transformed the socca into more of a vegan version of a frittata, hence the term soccattata. Whether this is eaten plain or dolled up with some other savory components, it is surprisingly rich and egg-like in taste and texture. This makes a perfect brunch or light dinner—it’s filling, packed with protein and super easy to make. 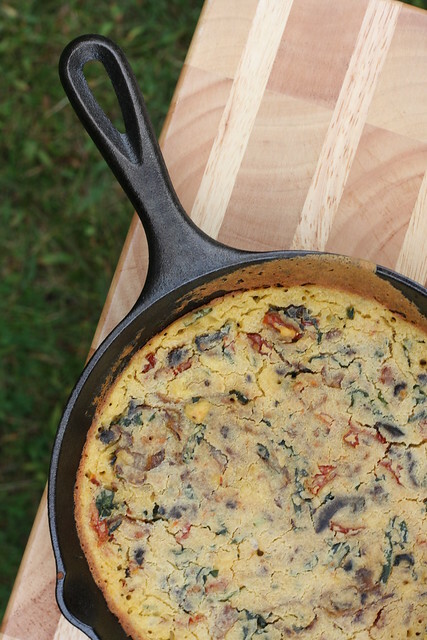 In a small 9-inch cast iron pan, heat a few tablespoons of olive oil over medium heat. Add in the sliced onions and saute for 10 minutes, stirring occasionally to prevent burning. Reduce the heat to the lowest setting and let the onions caramelize for about 30 minutes (don’t stir the onions as they caramelize). Fifteen minutes into your caramelizing time, preheat your oven to 400 degrees. After the onions are caramelized and your oven is preheated, increase the heat under your cast iron pan to high. Add in the olives, tomatoes and spinach to the pan with a couple tablespoons of oil. Saute until the spinach is reduced a bit, then add about two cups of the chickpea/water mixture to the pan. It should sizzle immediately. 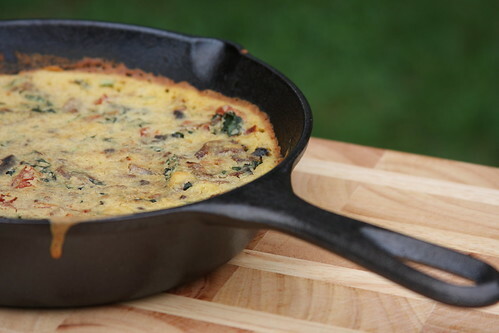 Place the entire cast iron pan into the oven and bake for about 20 minutes, or until it slightly browns around the edges. i can't believe i have yet to make socca. this recipe is amazing and now i must make a soccattata asap! I've never heard of this dish, but I'm definitely sold in! It looks fab! Thanks Caitlin! Let me know how it turns out! Thanks Fanny! I think you can put really anything in this: leftover greens, daiya, chopped carrots, etc. and it would still work. It still tastes delicious microwaved the next day! Oh, wow, that looks GOOD! I've never had socca, either, but I want to try it now. I saw your post on the PPK and decided I had to make this. I've never had socca either, but I'm in love with your soccattata. The flavors go together perfectly and it's really an easy dish to throw together. I had leftovers today and it reheated quite well. Just want to say thanks for sharing such a great recipe – this is one I'll make again for sure! Thanks for trying it out Elizabeth, and for your feedback … so glad you enjoyed it! Even though I am French, I've never heard of this bread. Maybe this is because I do not come from the south of the country 🙂 but this looks definitely like a sunny meal you can have in a vineyard… well done! I love chickpea pancakes and I can't wait to try this, it looks gorgeous! Huge fan of socca, but never thought about making it thicker. So I tried this out. WOW! An excellent breakfast or lunch dish that even the meat eaters loved! And like socca it’s really easy to make. Thank you so much for posting this recipe, Erin. Great to hear … so happy you enjoyed!